I was good all morning... made phone calls, answered emails that have been backing up and did a load of laundry. But since today was supposed to be the nicest day of the next three, I decided to go for a hike in the afternoon. Big M is a XC ski and mountain bike area in the Manistee National Forest. I've been working on getting the info for it collected for my Get Off The Couch web site, but it's really big and is going to take multiple trips to walk all the trails. Today Maggie the dog and I walked about seven miles. We did the Double Bit and Catamount Trails. 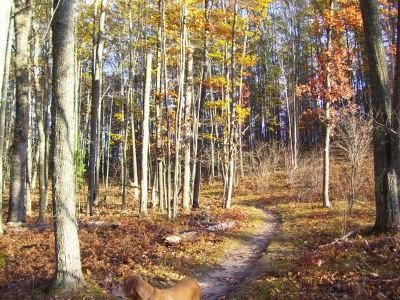 Quiet trails on a warm autumn day are great! 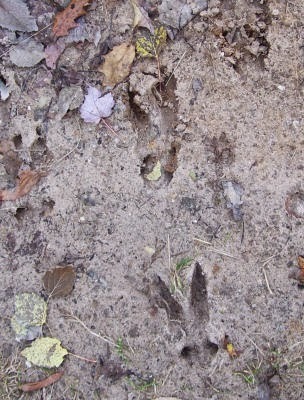 On one dirt two-track we found these tracks of a really big whitetail buck! We also saw a nuthatch, grouse, a great horned owl, and a sharp-shinned hawk. This may end up being one of the Quality Elements of the entire year. I can hardly believe that I've lived my whole life and never crossed paths with this poem before. Gerald Gould lived 1885-1936. He was an English writer and journalist. He regularly contributed poetry to the London Daily Herald. His poems were popular and a few appeared in collections, but many of them remain buried in newspaper morgues. Wander-Thirst is supposed to be his best-known poem. This was my last day at work in the apartment. I ate lunch sitting in the bay window, and read this poem over and over. I'm almost done with the temporary job for this month. But there is a real sense of accomplishment as we see the apartment move from a filthy, trashed space to a clean and really beautiful place to live. Here is the bay window. Believe me, I know this window well. I've washed, mended, primed, and painted every wood surface. Then I washed both sides of every pane of glass and storm window. The wall color doesn't show so well in the picture, but it's called Swiss Coffee, and it's a lovely creamy color. The woodwork is Decorator White. The carpeting went in today and now the place just looks so very inviting! I am very grateful to have had this job. It's been hard to juggle some of my personal projects and keep this going, but the income has been a real gift from God. I never really understood why bay windows were such a big deal before, either. But I've discovered while working within its "bay" that on any day when there is sun, even if it is very cold outside, that the angled panes concentrate the sunlight. I sometimes felt that it would be perfect to be a cat, curled up in that space. Of course, that made it a little hot to paint! 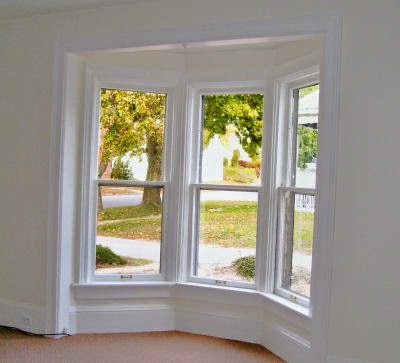 But now I know... bay windows were the sun rooms of the Victorian era. This has been an interesting week at my job. There are other people besides me working at the site, and I'm having trouble getting along with one of them. "Joan does not play well with others." sigh. But the good parts of the days are still the last remnants of the colors on the trees. 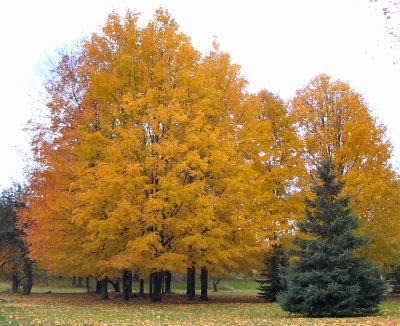 These wonderful maples positively glowed, even on a mostly gray day. So, it's Monday. Back at work. More painting and washing windows just didn't add up to much of a special day. Cold and damp, not much there to recommend the day either. Yet, on the way home, a stand of oaks flashed past at highway speed (oh, wait, I was the one moving at highway speed!) When I was a child, I would occasionally develop a desire to scrub the copper bottoms of the kitchen pots until the copper glowed a shiny, raw pink. That was a nice sense of accomplishment, but even more than the color of the clean copper I liked the colors that developed in the next few days as the pans were used on the gas stove. 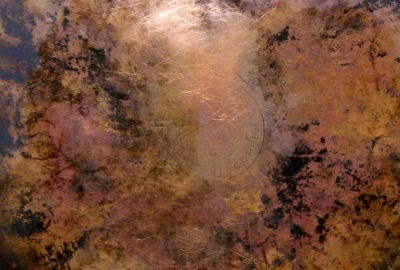 The copper would develop swirls of deeper color with blobs of rich browns, and even hints of greens and blues. The picture above is a poor substitute... same pans, but scrubbing the copper a bit just doesn't produce the same range and pattern of color as the process described. So back to the trees. Almost every autumn there will be some group of oaks that captures the colors from the copper pan bottoms... today I saw one for this year. That was good for a really big smile! Since I'll be continuing my temp job painting an apartment this week I wanted to make enough good food to see me through the week. If I come home too tired to fix something I'll just grab something really junky to eat, even though I prefer some good veggies or something. So today I made a pot of Gypsy Stew from the Moosewood Cookbook. Trying to do too much at one time, I overcooked it a little, but it's pretty good, just not so pretty to look at, as it would be if the colors were still bright. And I was brave and even added the tofu. It's ok, doesn't taste like much of anything really. 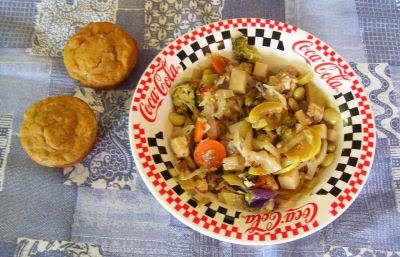 Pictured with the soup are Carrot Sweet Potato low-fat Muffins. I'll actually be eating those for my breakfasts. Now these are a loser on two fronts, but I'll eat them anyway. First of all, I thought I was trying a new recipe, but discovered when I was all done that the values were already in our big nutrition data base... so much for new. But why hadn't I made any notes on the recipe card? Who knows... I should have. They are pretty low on my list of favorite muffins, and they were a lot of work too. 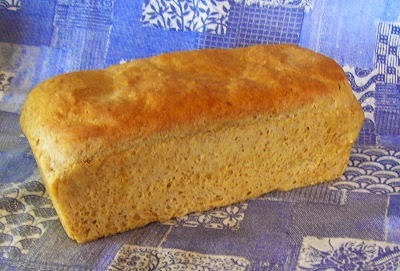 The big winner was more Pumpkin Bread which we already knew turns out to be quite good on a consistent basis. No exception today. Yum! So, I made a list to do all this cooking for today, and finished it by 3 pm, with the kitchen cleaned. That's a big accomplishment! One of the special quality elements of this past week occurred Thursday morning when we had our first hard frost of the season. 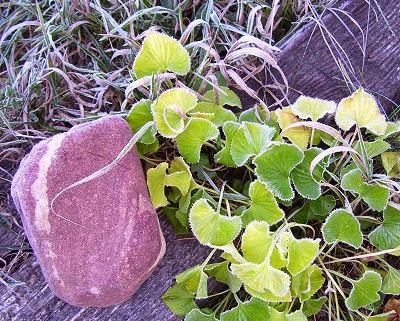 As I was leaving for work I peeked at my rock garden and discovered this violet with frosty edges. I didn't even realize what a nice contrast it made with the red Lake Superior banded sandstone until I looked at the picture later in the day.